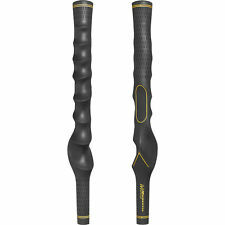 The speed whoosh claims to help you add 10 MPH of club speed in just 6 swings. That’s a big claim, right? How is it going to help you do that? Well, it’s essentially an over speed device. 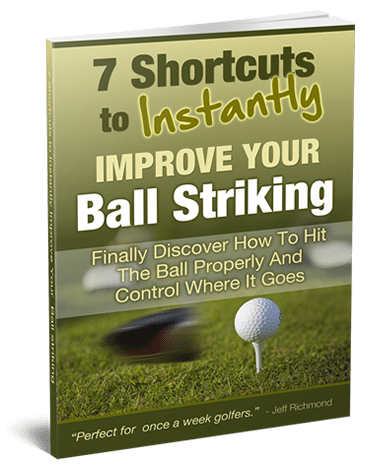 If you’re not familiar with that term, it simply means that you can swing it faster than your regular driver – therefore it will be teaching you to swing faster. you’ll be about 25 yards longer than normal. That’s a big difference! So let’s look at this training aid. First, it has a training grip on it. I don’t mind that because it is the grip I use anyway. But someone that uses a less than standard grip may hate it. However you can simply rip that grip off and put a standard grip on this no problem. Then there’s the shaft. The shaft is very flexible. Not like a normal driver shaft. This club is about the same length as a driver though. Then on the shaft you have a rather large plastic golf ball, which can slide up and down, or if you set it down the bottom it will just stay there throughout the swing, as it’s magnetic. They say this club weighs basically the same as a driver, so I weighed it. The weight of the Speed Whoosh is 282 grams. My driver is 299 grams. So it’s a little lighter than my driver. If you know the weight of your driver, you’ll be able to tell the difference based on the Speed Whoosh weight of 282 grams. Now there are two drills you can do with this training aid. The first is to slide the magnetic ball up near the grip end. When you do this the ball will stay there but at some point in your swing when you release the club the ball should slide down to the bottom of the shaft and stay there. From my testing with this it’s pretty hard to tell exactly when you have released the club, and whether that’s optimal or not. But I have pretty good lag anyway, so it’s probably not going to help me a great deal with that. If you know you don’t retain the lag in the dowswing, this training aid will help you to fix this problem. But if you have pretty good lag then this aspect of the training aid won’t be of much benefit to you. So then the next element is increasing swing speed. And I thought I would test this out in one setting, because they make a bold claim about adding 10 mph to your swing in 6 swings. So this is what I did. 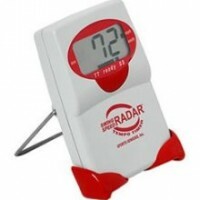 I got out my trusty Sport Sensor Swing Speed Radar (that you can get here). Then I had a little rest of about 5 minutes. Then I swung the Speed Whoosh 6 times. Here is the swing speed of those 6 swings. And compared with my first 6 swings with my normal driver I increased my swing speed by 7.2 mph. That means shots going 18 yards further! 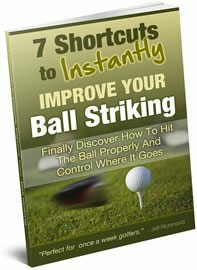 My 110 mph swing hits the ball about 270 – 280 yards on average. But a 117 mph swing will have the ball going near 300 yards! Shots going 18 yards further in 6 swings. I could not believe it. To say I was skeptical of this company’s claims was a huge understatement. And to be honest, I’ve had this club around for a while now and only swung it a few times to get a feel for it. It wasn’t until I did this full-on test did I understand the potential of this training aid. You can sure bet that I’m going to now start using this Speed Whoosh club a lot more. I’ll probably do the 6 swing thing a couple of times a week. You have to be very careful when doing that sort of training not to overdo it. You need to be real fresh to do it to see gains. I have to tell you though, the 6 final swings with my normal driver felt so much smoother. I was shocked to see the numbers I was getting, because my swing didn’t feel much different from the first 6. It did feel faster, but not in a trying sense. It was freer. That’s the only way I can describe it. But to feel this for yourself you’ve got to get one of these and use it consistently (i.e. a couple of times a week). I can’t imagine any golfer not picking up some easy yards using this. If I had to sum up the Speed Whoosh in one word it would be…. AWESOME! Oh, one more thing about this club. It’s great for warming up with. If you have 6 swings with this before you play you’re pretty much ready to go! To find out more about the Speed Whoosh simply go here.